To help contextualize the Gilets Jaunes protests in France, it is useful to return to an analysis of the Occupy Wall Street movement in 2011 and the theories of Guy Debord and Henri Lefebvre to understand the effectivity of urban mobilizations that simplify the political space and creatively critique the dominant ideology. The Occupy Wall Street (OWS) movement of 2011 in lower Manhattan did not follow the conventional tactics of a popular urban political uprising. Without a clear leader, or a concrete set of demands, the movement demonstrated a unique revolutionary form. OWS was defined by its creativity, individuality, and immobility. In the symbolic heart of the capitalist system, OWS highlighted the conflicts inherent within contemporary society and the urban experience. Yet the question remains: did the movement demonstrate an effective urban critique of the capitalist system? An effective form of subversion for some might entail explicit critiques of the particular government, or require structural change in the political and economic system. My definition for effective subversion is broader. It does not necessitate the reversal of an entire society, but rather one which challenges the dominant ideology through establishing a formidable alternative. Effective subversion can take different forms and styles, because I assume that the dominant ideology, in this case capitalism, is a hegemonic form which manifests in different modes of daily life, demonstrated by both the alienation of the individual and the hierarchical structure of society. To understand occupation as a modern revolutionary tactic, I will turn to the theory of détournement espoused by Guy Debord and the Situationists, as well as heterotopia expressed by Henri Lefebvre, to construct a lens to view OWS as an effective subversive space against the contemporary urban capitalist experience in three realms: the physical, social, and creative. Guy Debord, a founding member of the Situationist International, argued that modern capitalist society consisted of spectacles which prevented the individual’s ability to live a genuine life. They maintained that the spectacle, mediated through images (mass media, advertising and film), permeates the intimacy of everyday life. Henri Lefebvre, a Marxist philosopher who also critiqued the everyday, maintains that capitalist society appropriates the daily urban experience and common spaces. In his book The Urban Revolution, Lefebvre argues that urban life is one of “controlled consumption.” For Lefebvre, the city expresses the dominant ideology in a tangible form through the ways it defines space, the politics of space, and the individuals occupying such space. Thus, revolution requires the control of space. Lefebvre conceived of isotopy and heterotopy, as different ways to conceptualize the appropriation and contradiction of urban space. Isotopies are multifunctional places -such as broad avenues and other large voids within the urban settings which enable the efficient exchange of goods and services. Therefore, isotopic spaces allow the dominant ideology to function and prosper through establishing a rational spatial order. Subverting the dominant system requires the establishment of heterotopic spaces, which demonstrate that an alternative to everyday commodified society and space is possible. Both the Situationists’ strategy of détournement and Lefebvre’s conception of heterotopia share a similar regard for the necessity of transforming the urban everyday experience in order to effectively challenge the dominant ideology. It can be useful to think about the relationship between the two concepts as one of technique and desired outcome. Détournement defines the process of reappropriation, which can create an alternative space of difference that Lefebvre would describe as a heterotopia. Occupy Wall Street, inspired by the Arab Spring protests, as well as various popular mobilizations in 2011 in European cities as a response to the crash of 2008, began on September 17th 2011. With the initial intent of occupying the Chase Manhattan Plaza, around 2,000 protesters were faced by armed police and ended up congregating in the concrete plaza a block to the west named Zuccotti Park. Ultimately, the movement gained rapid attention as a protest against corporate power and greed along with the modern everyday urban experience. The occupation lasted nearly three months – ending on November 15th when police evicted the occupiers. The occupation of Zuccotti Park demonstrated the formation of a heterotopic space through the technique of détournement. The park was traditionally an atomistic space. Used primarily as a passageway for office workers between their offices and the subway, or as a place to eat a quick meal, the park demonstrated a homogeneous space without significant conflict or contrast. Yet through the physical occupation of Zuccotti Park – the dynamic of the space changed, thus effectively subverting the ideology which the park traditionally symbolized. For Lefebvre, capitalism creates urban public spaces in its own image to promote efficient transfer and production of capital. This can be applied to Zuccotti Park in two senses. Firstly, capitalism requires the productive transfer of goods and services. Zuccotti Park, as a passageway between the essential focal points of the financial district, exemplifies the consistent movement of workers in a state of flux. The office workers do not use the space for its aesthetic appeal, but rather, as Lefebvre maintains, a “necessary transition between forced labour, programmed leisure and habituation.” Thus, transforming a space designed for consistent flux, into one of static and constant habituation, subverts the meaning of the space and the ideology behind the formation of such a space. Secondly, Zuccotti Park was not intended to provide a public place of leisure, but was rather a concession with the city to permit the erection of another building. The park is privately owned, built from an agreement for a zoning concession by a nearby building. The park is neither truly public, nor made in the interest of the public, but rather owned and generated for the purpose of generating profit. The physical occupation of the park demonstrated the strategy of détournement through an inversion of the function and ideology behind the formation of the space. The explicit juxtaposition between the business men on their way to or from the office and the individuals occupying the space, exemplified what Debord explains as the formation of a situation which “supersedes the original elements and produces a synthetic organization of greater efficacy.” This phenomenon is illustrated in the image below, showing the morning commute of office workers utilizing the space as a passageway while the occupiers controlled and defined the space around them. Returning to Lefebvre’s concept of heterotopy, it is evident that the occupation demonstrated such a formation. Lefebvre, in The Urban Revolution, exemplifies the impact of constant habituation on challenging the dominant ideology by “reversing the situation, inverting meaning: what appeared to be subordinate is now dominate.” Through inverting the ephemeral space, the occupation became a liberating activity because it challenged the everyday urban routine and practice. The occupation became a heterotopy – creating a conflict between the place “of the other, simultaneously excluded and interwoven.” Zuccotti Park, following an egalitarian set of social relations and organizational structures, transformed into an alternative society. The social and organizational structure of OWS effectively modeled an alternative society based on egalitarianism and genuine personal relations. One of the central features of the social organization within the occupation of Zuccotti Park was an emphasis on horizontal decision making. This egalitarian decision making was achieved through a process of consensus in which ten percent of the body could “block any proposal.” This process countered the constant sense of urgency that is normally present within a space in the heart of the financial district. The occupiers also utilized a process called the human microphone to amplify speeches, which eliminated the normative distinction between the speaker and audience. The permission to use an amplification device such as a PA system or electronic megaphone in New York City requires a permit approved by the police commissioner. The occupiers were denied such a permit and thus resorted to the use of the human microphone. Inverting the normative practice of reciting a speech into a participatory activity illuminates the technique of détournement by destabilizing the normative distinction between speaker and spectator. All of the occupiers became the megaphone, the medium of transporting information, thus effectively challenging the dominant rules meant to curtail popular demonstrations and empowering the participants. Various working groups and social programs within Zuccotti Park indicated the formation of an alternative society. David Graeber maintains that Zuccotti Park became a space to “experiment with creating the institutions of a new society.” Challenging the basic social norms within urban society through the establishment of new social and decision making processes, signifies an effective form of subversion. Because the very demonstration of an alternative urban lifestyle indicates the social construction of most social and organizational structures, it empowers those participating and watching the movement to realize that the system as a whole is susceptible to change. People were enjoying the genuine company of others on a creative social basis, not merely explicitly political. This degree of collective energy instituted a stark contrast to the alienation of the figures normally walking around the financial district. The positive playful energy marked the establishment of a heterotopia – an active space of authentic human connection. From the inception of OWS, artists played a pertinent role in expressing the sentiment of the movement by challenging the dominant ideology of everyday life. The creative outpour was demonstrated through different endeavors – such as homemade signs, slogans, and the reappropriation of material objects found within the everyday urban experience such as signs made from the extraction of cardboard from pizza boxes. These cardboard signs of OWS became a distinct and playful New York form of détournement. Furthermore, Adbusters produced an United States flag and pasted the logos of major corporations in place of the stars in the upper left corner, illustrating the influence that corporations have on the political system. The logos range from Citi bank to the pharmaceutical company Pfizer. The flag, normally used to demonstrate patriotism, here achieved the opposite effect by provoking questions of who actually rules the country and controls one’s daily life. The flag is a rather explicit demonstration of détournement. The various artistic and creative manifestations of the Occupy Wall Street movement demonstrated the utilization of détournement through subverting common symbols associated with the everyday, political and economic system. Thus, creative agency became an effective tool to establish a counter space and challenge the dominant hegemony. Some claim that OWS was a failure when considering how rapidly it dissipated without generating real change. One can cite how the lack of a clear leader or agenda, and the consensus driven decision making process, were all factors that ultimately led to the quick disappearance of the movement without achieving any substantial reform of the system. This argument has merit, considering that the movement only lasted a couple months and did not change the economic system nor negate the alienation of daily life. 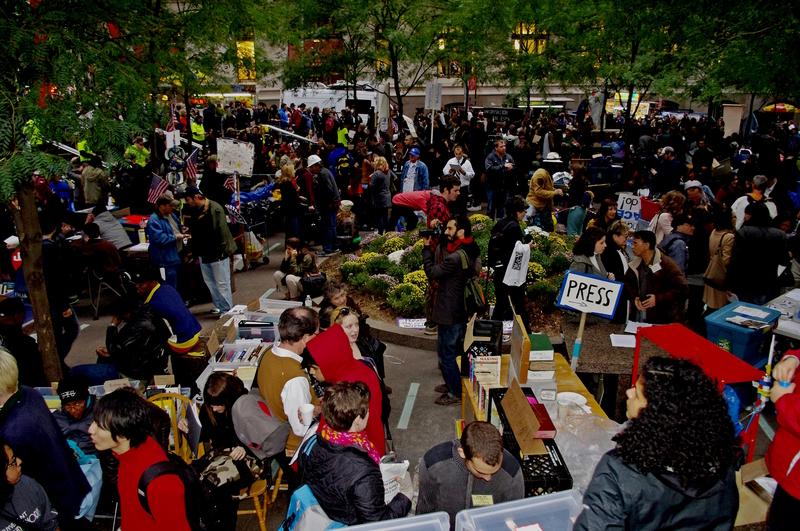 Yet it is fair to argue that OWS, through its short, high energy enthusiasm for the creation of an alternative space, was in fact an example of its success. The movement raised the issues of wealth inequality, corporate greed, and student debt to the general discourse within the United States. For example, Bernie Sanders surge in popularity can be cited as a continuation of the sentiments popularized by OWS. Ultimately, my argument is not that OWS was effective in terms of completely overturning the system, but that its tactics and technique, understood through the Situationists and Henri Lefebvre, allows one to understand the movement as both a demonstration of an alternative society and the contradictions within the dominant capitalist ideology. Through the lens of Lefebvre, David Harvey maintains that “anomic groups construct heterotopic spaces, which are eventually reclaimed by the dominant praxis.” An effective movement does not necessarily imply the eradication of an entire system, but rather can be viewed in relation to its temporal vitality. Even if only active for a couple months, OWS was a brief moment when the normal daily life and ideology was countered through play, community, and creativity. It was a moment of awakening, that even in its short life can be seen as a success – and thus a model for future revolutionary mobilizations. This is great- so relevant!